This week’s guest blogger is Melissa Di Cocco. She is a lover of life, travel and going on adventures. Melissa is a self-diagnosed health and fitness nut and movie addict. With Italian roots and fabulous hair, Melissa is always rocking the latest fashion trends and setting her own style along the way. She’s spent many years working in communications in the big apple, and worked as a style and communications consultant at a high-end swimwear boutique in the enchanted city of Rome. Afterwards, she ventured out to the west coast and tackled the City of Angels. Each day she strives to be her best self, and makes a difference in the world, in her own special ways. Follow the sweetness, style and fun at @sweetmeliissa (Instagram). Click here for Melissa’s South American Beats - Jams from Buenos Aires and Uruguay playlist to get you in the groove of Latin America and chill vibes and booty shake your way on @SweetMeliissa’s trip. Last Fall, my cousin Hayley and I were out to dinner and decided we wanted to plan a trip. She’s a lover of life and travel and wants to explore every corner of the world just as much as I do. We wanted to pick a place neither of us had been to so we had decided on Argentina and Uruguay. She had never been to South America and I only once, for a magical wedding in Lima, Peru about a year prior that left me lusting to go back. When we started planning, after looking at a map and realizing how close Uruguay is to Buenos Aires we knew we had to include this in part of our adventure. We both had heard that Uruguay shares many of the qualities of Italy and being that we are both Italian we had to check it out. We arrived in Buenos Aires at 5am on February 16th. Being that it was so early and we were bit tired and out of it we decided to crash at a hotel near the airport to fit in a couple more hours or sleep before we started the day so we headed to Hotel Plaza Central Canning in Canning, Argentina. We slept until about 11am and then headed out to grab something to eat. The hotel is located within a beautiful plaza with shops and restaurants. We stopped to get some Yerba Mate. I had never heard of Yerba Mate before, Hayley owns her own tea shop (https://www.saratogateaandhoney.com) so of course this was her expertise. Yerba Mate is a drink which is supposed give you the strength of coffee and the health benefits of tea with some chocolate flavor as well. It’s the national drink of Argentina, Paraguay, Uruguay and Southern Brazil. We enjoyed and got energized from our Yerba Mate and then checked out and headed into Buenos Aires. Our AirBnB was located the Palermo neighborhood. We got settled and decided to walk around the city in the afternoon. We walked to the Recoleta Cemetery which was absolutely beautiful. We also checked out the Basilica de Nuestra Senora Del Pilar right next door, there is a museum inside which shows what it was like back in the day when the Recoleta monks used to inhabit the church back in colonial times. On our walk back to our AirBnb we grabbed some ice cream at Freddo, the Dulce De Leche yummy! When we got back to our place it was about 8pm, still was to early for dinner so we relaxed a bit on our patio and tried to decide where to go for dinner. We decided on Proper (http://www.properbsas.com.ar). The vibe was cool, it’s located inside and unused mechanic shop. There are a couple of big communal tables, and it’s great for groups, terrific small dishes designed for sharing. When we arrived there was a wait but we were treated to glasses of wine until we were seated which was treat. The meal was one of our bests! We ended the night with a little dancing at Niceto Club (http://nicetoclub.com). We were out a little late the night before so we started our day around noon. We walked to Puerto Madero, just to check in out. It’s a little more touristy and there are some cool skyscrapers but not too much to see so we didn’t stay long. We made our way to Galerías Pacífico to do a little shopping and then headed for some lunch at Le Puerto Rico (https://www.lonelyplanet.com/argentina/buenos-aires/nightlife/la-puerto-rico/a/poi-dri/394619/363005). After lunch we walked around San Telmo a little bit and then decided to rest and have an aperitivo before we headed home to change and get ready for the night. We decided we wanted a classic Argentine steak for dinner so we headed to Don Julio (http://www.parrilladonjulio.com). We arrived around 10pm and again were treated to wine until our table was ready. We waited for about an hour, the scene was exciting, so many people outside talking, drinking and waiting to enjoy a delicious meal. We made some friendly conversation with some Italians we overheard talking in their native napoletano dialect until we were called to be seated. We sat outside on the cobble stone street and indulged ourselves in a delicious flavorful steak. I really wanted to check out La Boca neighborhood, so we headed there first. La Boca is bright and colorful and alive. We were told that when we go, to go between the hours of 10am and 6pm not before or after because it’s dangerous, a lot of crime happens in this neighborhood despite all of it’s beauty and vibrant energy. Tango dancers were everywhere performing in the streets, the buildings were painted red, orange, green, yellow and filled with beautiful graffiti. La Boca has a bit of European influence, it’s earliest settlers were from Italy. After we walked around the neighborhood we stopped at the Benito Quinquela Martin Museum (http://www.buenosaires.gob.ar/museoquinquelamartin) Benito Quinquela Martin was an Argentine painter, he was one of the most famous in Argentina and he was born in La Boca. The museum is actually his house, you can see where and how he lived and you have access to rooftop where you can get amazing panoramic views of the city. After we left La Boca we headed to San Telmo, it was Sunday and on Sundays there is a huge market that spans miles. It’s impossible to walk the entire market in one day but I have to say we tried. We went left and right and the market never stopped, we found antiques, valuables and unique gifts to bring home to family and friends. After out big shopping adventure we were famished and found ourselves in a small indoor market eating the best empanadas of our trip. We rose early. Today we were headed to Uruguay!! We got to the port around 630am as we had to catch a 7:15am Buquebus ferry to Montevideo. The ferry was like something I had never seen before. We had to put on shoe covers to keep the floors clean, it looked like something of the future. It was quick, and very comfortable. Once we arrived we went straight to Avis to pick up our car we had rented, we hopped in and drove up the coast to Punta del Este. We couldn’t wait to get to our hotel and jump in ocean. We needed some beach time! After a few drinks and some time soaking in the sun we headed to our room to get ready for dinner. We had decided on Restaurante Al Forno, (http://www.restaurantealforno.com). We had so many amazing meals while on our trip but I have to say this was hands down the most memorable. The chef came out and explained the entire menu to us, he helped us decided on what dishes to choose and was just incredibly friendly, kind and wonderful to us. We had a crab lasagna that I still dream about. The entire dining experience was something special that I’ll never forget. It was a perfect morning for a bike ride, so that’s what we did to see more of Punta del Este’s beautiful coast and sites. Later that morning we got in our car and headed to La Pedrera. La Padrera is a small beach town about an hour and half outside Punta del Este. It’s a little more bohemian and less chic than Punta del Este. When we got there, we checked in to our hotel and walked straight to the beach. It’s a small town so everything is walkable which was wonderful. We spent the day relaxing and then later in the afternoon we walked the main street to check out the little shops and restaurants. The next day, was a tropical storm which was actually quite beautiful in its own right. We spent the day at the hotel restaurant drinking wine and learning to play rummy. Once the clouds and rain cleared later that afternoon we walked on the beach, the waves were so high and wild and the sky was a beautiful purplish pink. We watched the surfers ride the waves until the sun set and found a restaurant to enjoy our last meal in this tranquil paradise. 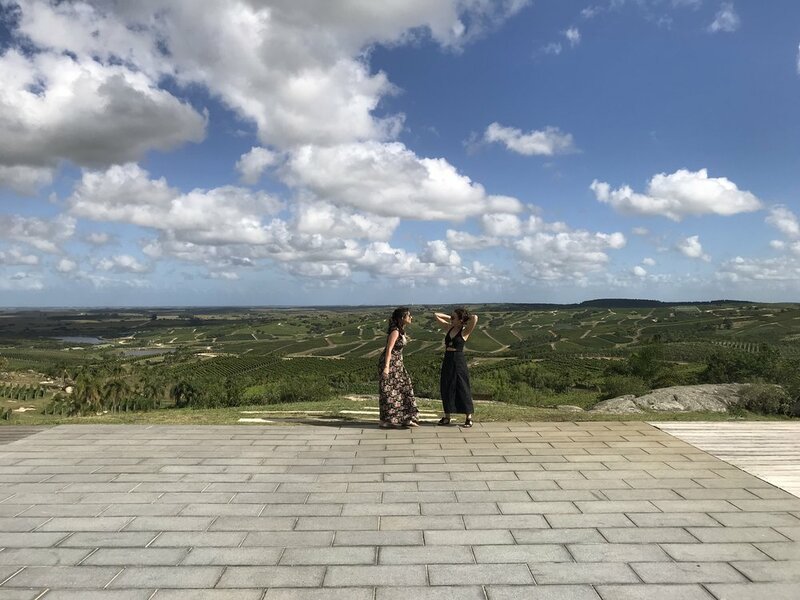 Today was the day we went to Bodega Garzón, a famous winery in Uruguay. We arrived around 12:30pm for a tour and then had lunch looking over miles of vineyards and olive trees. I swear the amount of wine and olive oil we consumed was a record and the bread was divine. This was the best lunch! Again, the quality of service was impeccable. Everyone was so kind, the chef came out and talked to us and even took us back in the kitchen. The chef at our hotel in La Pedrera had told us about a gastronomical festival that night in José Ignacio and as it turns out Bodega Garzón would have a stand at the festival! We couldn’t wait to go and eat more and hang out with our new friends from the winery! After lunch we headed to our hotel in José Ignacio. We walked around the beach town for a little, stopped for some tea and watched another incredible sunset before we got changed and ready for the festival. There was music, drinks and plenty of food and everyone in town was there! We drank, ate and danced the night away. Today we had to head back to Montevideo to take the Buquebus ferry back to Buenos Aires. But before we left we wanted to stop back in Punta del Este to check out Casa Pueblo. Casa Pueblo is a building that was constructed by Carlos Páez Vilaró, a famous Uruguayan artist. It was originally his summer home but now it is a hotel, museum and art gallery. He was friends with Pablo Picasso, he painted murals for Marlon Brando and was invited to Egypt by President Nasser. He made the acquaintance of Fidel Castro, John F Kennedy and Sophia Loren and became friendly with Brigitte Bardot. Casa Pueblo was quite a beauty to see, we stayed for lunch and enjoyed the views of the ocean before we got back in the car and headed to the port of Montevideo. We got on the 7:15pm ferry back to Buenos Aires which got us back in the city around 9:45pm, we headed to the hotel to quickly to change before we had our last dinner out in Buenos Aires. We chose a jewish restaurant called, Mishiguene (http://www.mishiguene.com) which featured traditional jewish dishes with a modern twist and the atmosphere was lively. It was a Friday and so there was an accordionist and a clarinettist playing klezmer music and breaking into dance! We couldn’t decided on desserts so we chose 3. What a fun night and great way to spend our last evening in this beautiful city! Our last day in Buenos Aires!!! We spent the day walking around Palermo Soho shopping, chatting, feeling inspired and taking in every last moment. We had such a tremendous and extraordinary week, surrounded by lovely people and magnificent sights. Our flight didn’t leave until midnight so we had some time to celebrate our great adventure with one last aperitivo before we had to head to the airport. We said cheers and asked, “Where to next?!! !”.